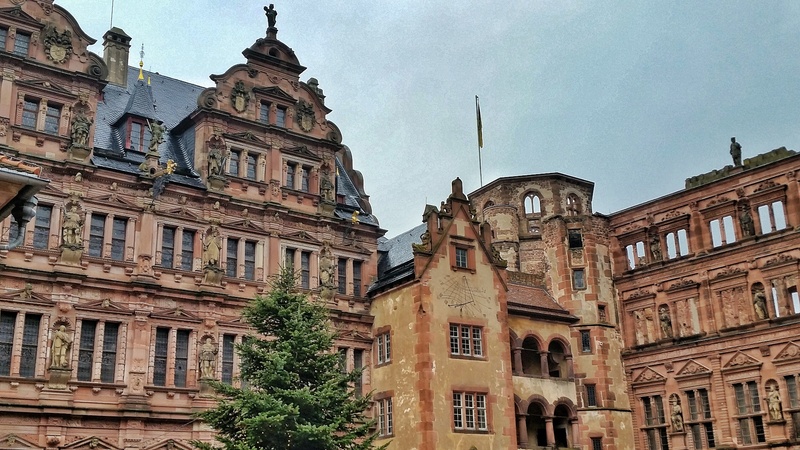 Heidelberg is a charming old German town that was largely untouched by the destruction of World War II. As a result, most of the architecture in the old town is original, giving the visitor the feeling of being transported back in time. 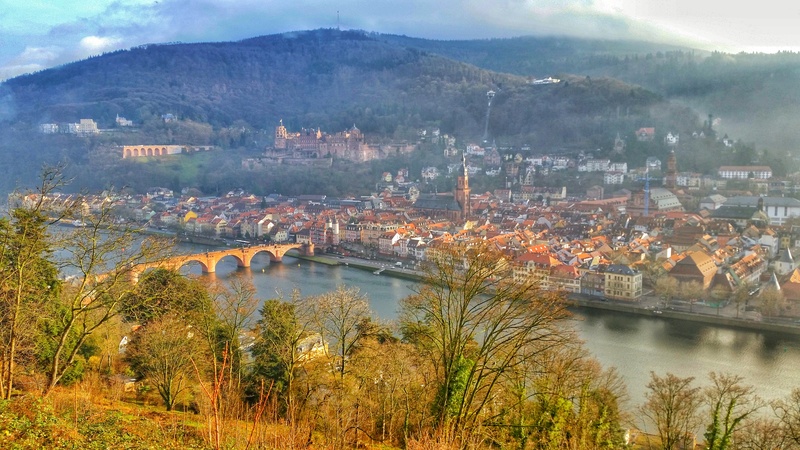 Due to its proximity to Frankfurt, a major transportation and business hub, Heidelberg is a popular destination for day-trippers and people looking to spend a quick weekend getaway in a charismatic and history filled city. 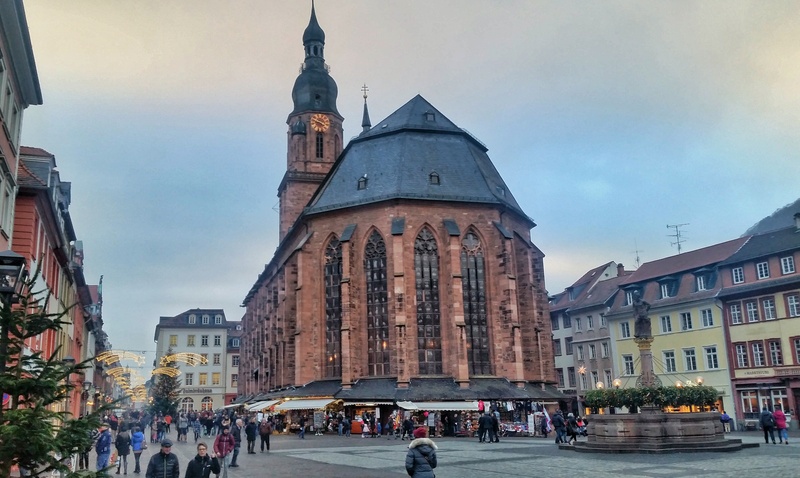 While we visited for a short two days prior to our (disastrous) departure out of Frankfurt, we found a city with plenty to do and see that is perfect for a short visit. 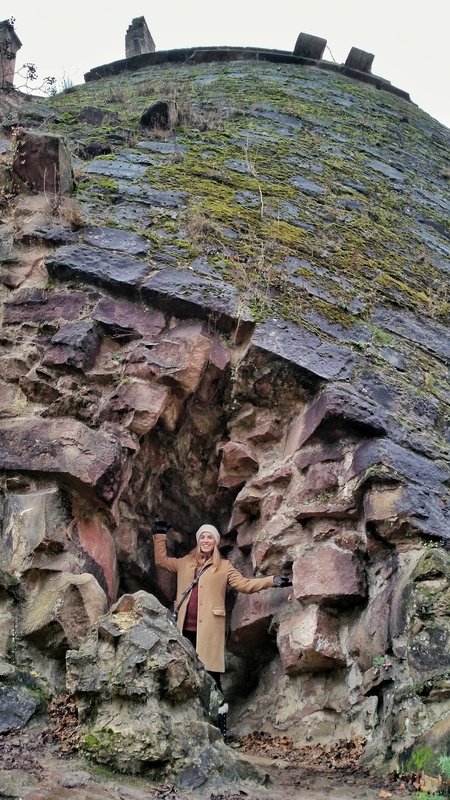 Perhaps the most obvious thing to do in Heidelberg is to head on up to that huge castle that can be seen from most spots in the city where it rests on a hill in all its glory. The castle is remarkably well preserved, despite having existed since 1214 AD. 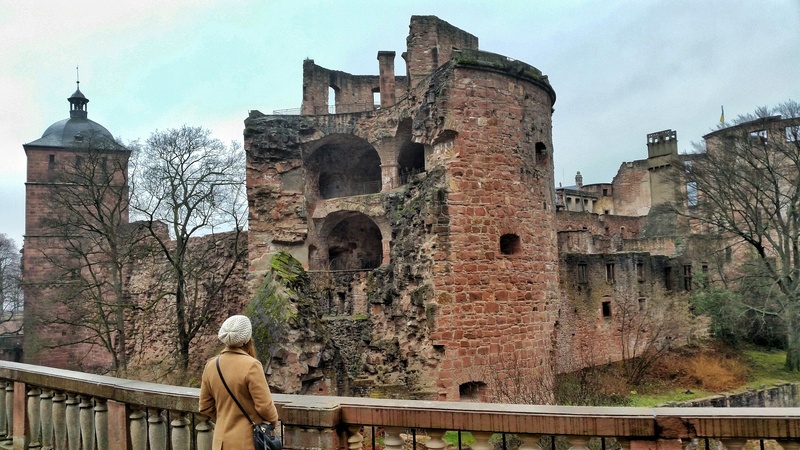 Though it was partially destroyed in the 1600s by a lightning bolt, and subsequent fire, and later was pillaged by citizens of Heidelberg for building materials for their houses, the castle has been preserved and is in exceptionally good condition. 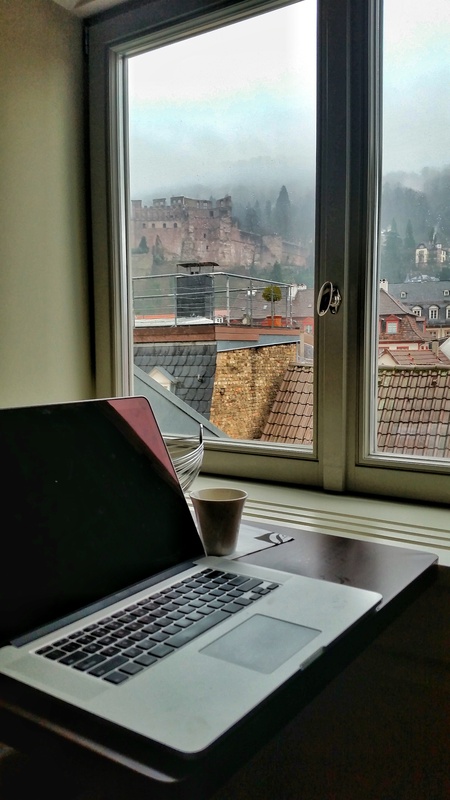 View of the castle from our attic apartment in the altstadt. There are two ways in which to reach the castle: You can take the quick funicular right up the hill in a matter of minutes, or for the more active traveler, you can take a short hike up the hill to get your heart rate going, and have a bit of a better view on the way up. Once you reach the top, you are free to roam the grounds, taking in all the history on display. We quite enjoyed checking out the toppled tower column around the back of the castle. 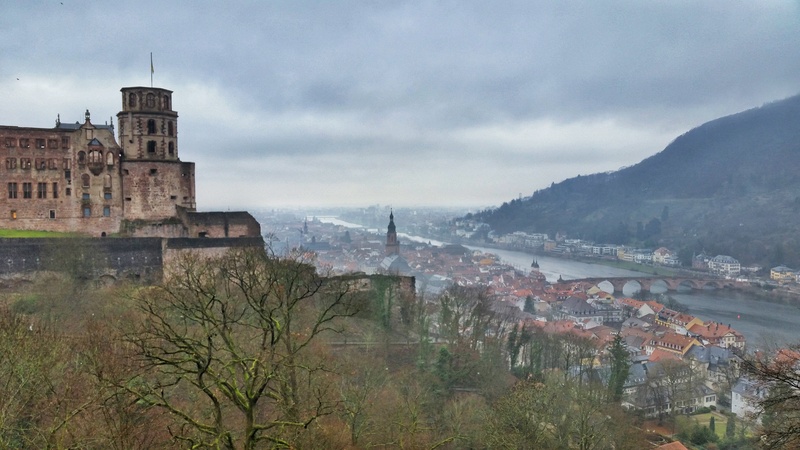 Walking around to the front side of the castle, you are treated to a commanding view of Heidelberg, with it’s iconic Old Bridge that crosses the Neckar river. Walking down the cobblestone streets, worn into rounded stones from thousands of years of feet ambling over them, you get the feeling that you could be in an earlier era, that is until you bump into a random Subway or McDonalds. Just as many other tourist friendly European historical centers have morphed into kitschy souvenir shops and chain fast food restaurants, Heidelberg has its share of gimmicky shops, but wander just a block off the main tourist drag, and you’ll be rewarded with less crowded and more authentic bars and shops, and far fewer people around. That’s not to say that one shouldn’t check out the more touristy areas as well, I mean, its popular for good reason! When in Germany, one should do as the Germans do, which is to load up on carbs by drinking copious amounts of Pilsner and eating monstrous pretzels. 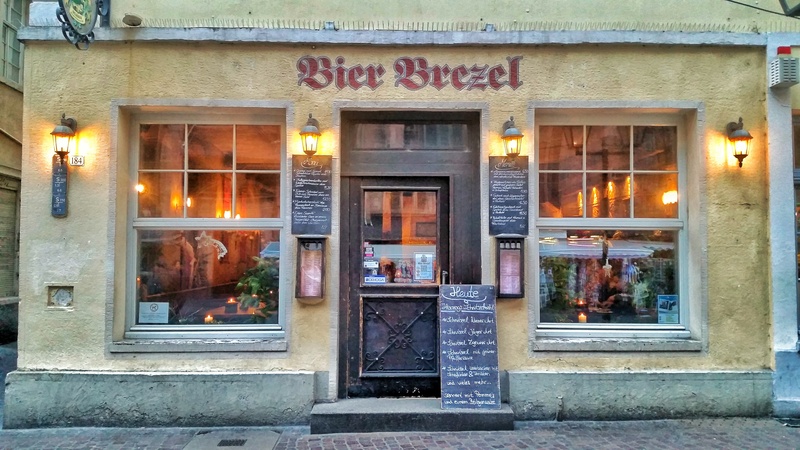 One of our favorite discoveries was a cozy little bar called Bier Brezel (literally: Beer Pretzel), where every beer you ordered came along with a basket of beer bread pretzels, that while not like the typical German pretzel, was delicious in its own right. We ended up in Bier Brezel on more than one occasion in our 2 days in town – it made for a perfect escape from a rain storm that passed through as we were walking around. Nab a spot by the window for the perfect people watching opportunity. We also stumbled into a little bar/restaurant that I cannot for the life of me remember the name of, but was a great place to have a couple of beers while reflecting back on our trip thus far. 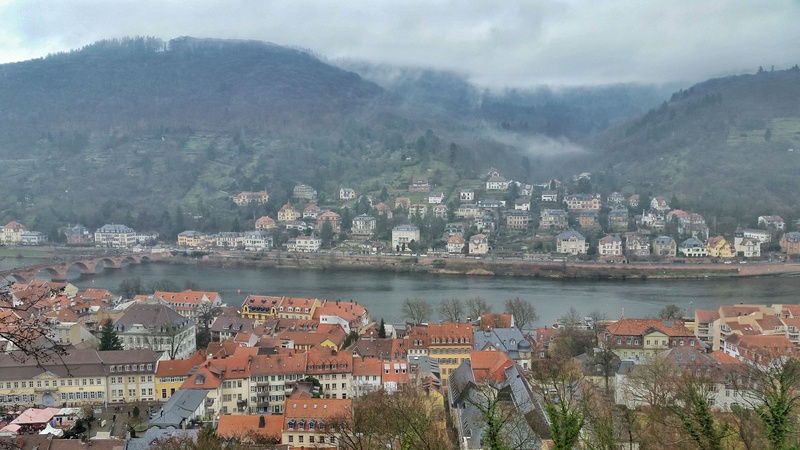 Another way to get in some exercise and amazing views is to take the Philosophenweg (Philosopher’s Walk), across the Neckar river from the Altstadt. The trail goes upward mercilessly for quite some time before it levels out and gives you panoramic views of the town of Heidelberg far below you. Its name, it is said, stems from the fact that university professors and philosophers walked there, perhaps using the solitude of the forest and the incredible views of the city and surrounding area for inspiration. From the Old Bridge, it took us exactly 30 minutes to walk to the start of the trail, and another hour on the trail itself. 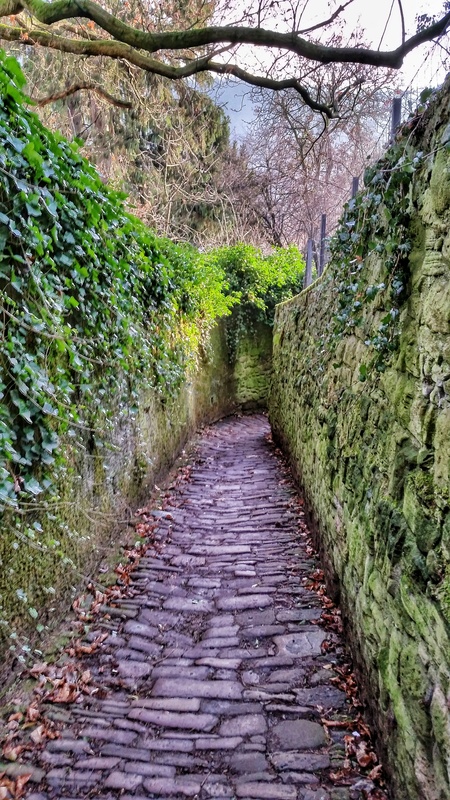 At the end of the trail, you head down a steep, ivy covered cobblestone path that winds its way back down the hill, depositing you just across the street from the old bridge. There are many other paths you can meander along while taking the walk that lead to old ruins, but for the sake of time, we stayed to the main path at the edge of the hill. 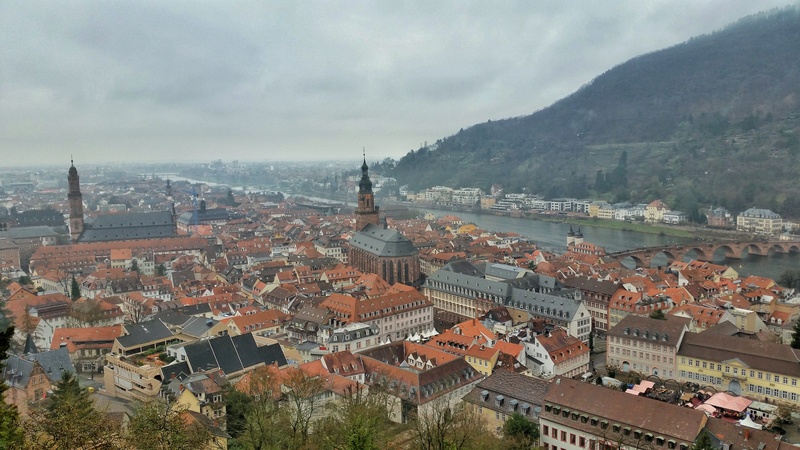 Heidelberg is a great stop for a few days with plenty to do. There was a lot more to be done here, but being that it was New Year’s Eve during our visit, many things were shut down for the weekend. 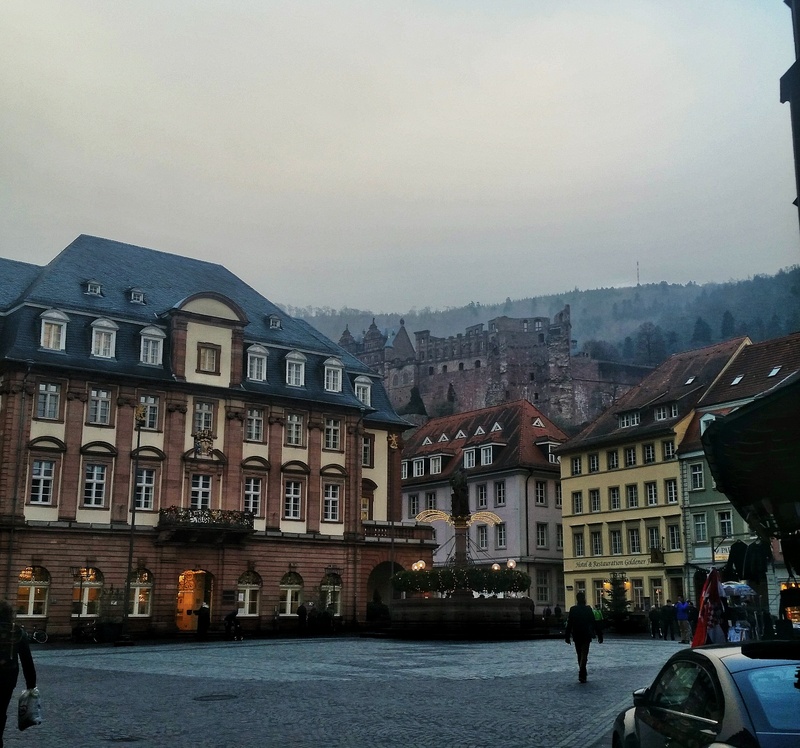 If you have a few more days in the area, Heidelberg can make a great central location for day trips to Mannheim or Rothenburg ob der Tauber. Ok, now I want to visit Heidelberg. 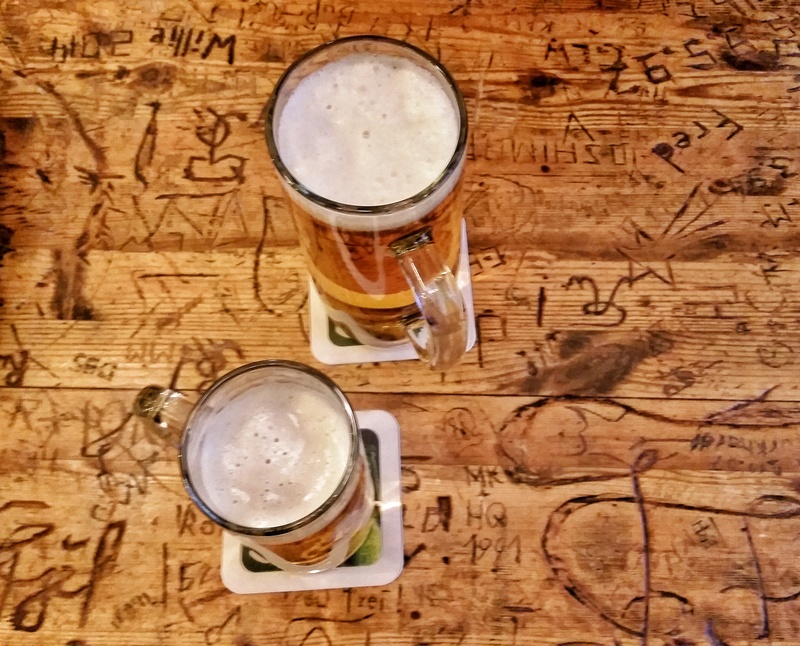 Your things to do in 2 days are right up my alley – hiking followed by beer and pretzels! That’s one of the best things about a good hike, you can reward yourself afterwards with plenty of carbs and not feel bad about it! Great Picture!I lived in Heidelberg 1959-61 as a military dedenpent, and ranged out of the golden ghetto as much and often as I could. The Philosophenweg (and a small tavern below it) were favored haunts with my friends.Worth mentioning that while Heidelberg escaped damage in World War II, it was not immune to war; the Castle was burned by French troops in the 1680s, in the dynastic wars that ranged across large parts of Europe at the time; the event is celebrated(?) each summer by fireworks shows that give the impression that it is burning again.And one note on the Heiliggeistkirche: It’s Lutheran now, but from about 1700 until 1936 it was partitioned down the length of the nave so that it could serve both Protestants and Catholics. I was contemplating going to Heidelberg from Kaiserslautern since I will be there in July 2016. Your post convince me that Heidelberg is not to be miss. By the way, beautiful photos.